MODEL TWIN RB75A hand/air portable power unit for aircraft and combat vehicles SUPPLIED WITH UNIT • Totally weather protected. • Air transportable, 'Non Hazardous' • Maintenance free. • Tough and compact. • No memory effect. • Works in any orientation. • High charge retention. • Long shelf life. • Fast recharge. • External charger for prolonged unit life. • No cycling. • Leak proof. • Cells replaceable on condition. • Heavy duty engine starting of turbo prop, turbine, aircraft and helicopters. • Starts Main Battle Tanks. • Starts Armoured Fighting Vehicles. 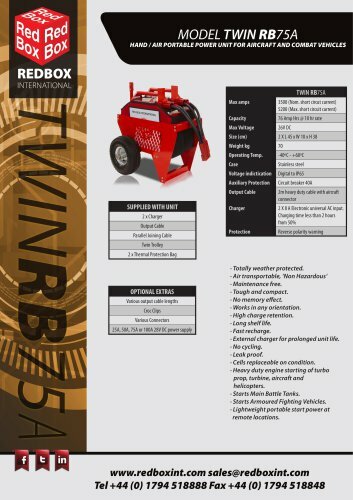 • Lightweight portable start power at remote locations.